When I was looking over at the summary of last year, I did enter 2nd place overall in SB (Super Big) class with the Suzuki GSXS1000 in 2017. This is what I wrote the same time last year in this period. Well now that the season is over, I can see that I haven’t got champion status in the full season of 2018. In the immediately following NAPS MOTOGYM a.k.a. “Sudo Genki Cup”, I was able to win against notorious “The Champ” Takashi Tominaga and I became the first champion of this tournament. Video of Finals from Sudo Genki’s NAPS MOTOGYM tournament 2018 in Ooiso Long Beach Kanagawa Japan. From the first elimination round. Close up video of the Final race. But overall in the Dunlop Cup Rounds I finished 4th overall in the SB(Super Big) class ranking in 2018. Considering the potential of my Suzuki GSXS1000, I think that it was a satisfactory result. I was disappointed because I was 2nd in total until the final round, but I think that I was still able to more. I would say that I scored 95 points out of 100, but the remaining 5 points I would have to say are from careless mistakes and self destruction that lead to missed winnings. Anyway in addition, a highlight of 2018 was that I participated in a moto gymkhana event held in Beijing China in October. The first gymkhana event in my life abroad. It was very stimulating and I managed to make a lot of Chinese friends. I wonder if anybody else is willing to invite me over to their country in the future? I’m open to requests! Time trial with a borrowed VTR250 in Beijing China 2018. In December I participated in the event of Okinawa’s bike shop “Autoban” and ended the fulfilling 2018 year. And from mid season to end of 2019, I decided to compete with the Kawasaki Ninja 400, aside of the Dunlop Cup tournaments. I tried to set up my Kawasaki Ninja 400 as best as possible. When the competition season starts, I will boil down the setup further and I think now the potential of this machine has improved drastically. Perhaps I think that it is going to be about 101% as compared to the top lap-time. For the immediate objective I also want to win the overall victory once and for all !! 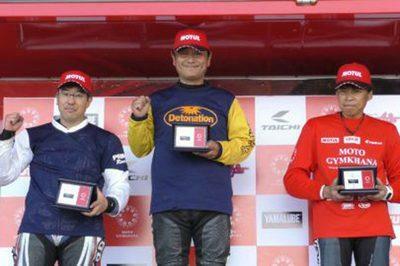 I’d like to try Moto Gymkhana and try my best to win one more winning year in my 30th year as an athlete of this sport. I plan solo motorcycle touring over Japan this year as well. Basically I will bring my Honda CB750 on long haul expeditions of Gymkhana. Then I plan to do a tandem touring with my wife while we are there. Allot of things planned up my sleeve for this year. Oh, what kind of year will this year be? I will be looking forward to it all.